It's hard to say where and when mules came back into fashion, but I'd like to thank whoever is responsible for it. 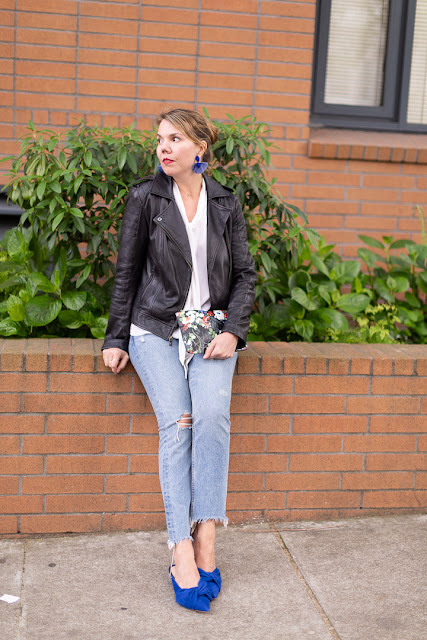 As someone with narrow heels whose shoes often slip in the back, I find them incredibly comfortable and surprisingly flattering on the foot, too. 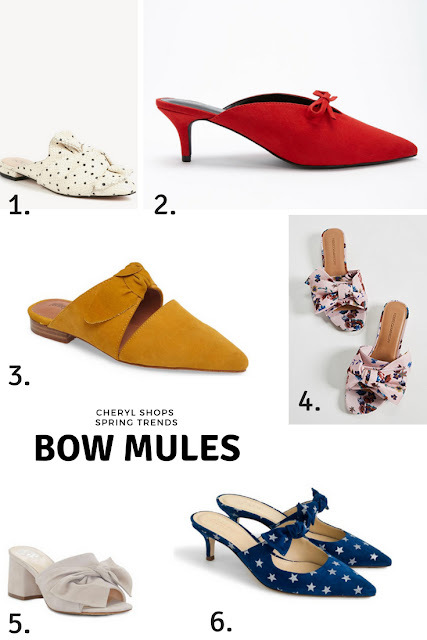 There are so many different kinds out there, from dainty and kitten-heeled to streamlined and flat, but my favorites incorporate some sort of bow or twist into the design. They're very feminine overall, but with many interpretations of the trend, there's really something for everyone. 1. 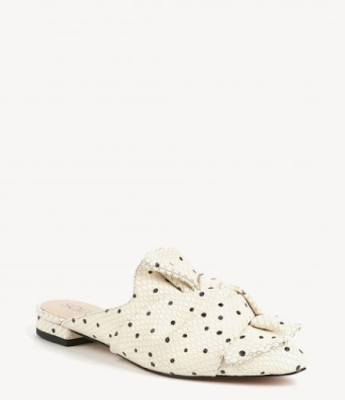 I love the polka-dot pattern and the exaggerated bow-tie on these flats. You could get away with wearing them to work, but they'd be equally perfect for the weekend. 2. 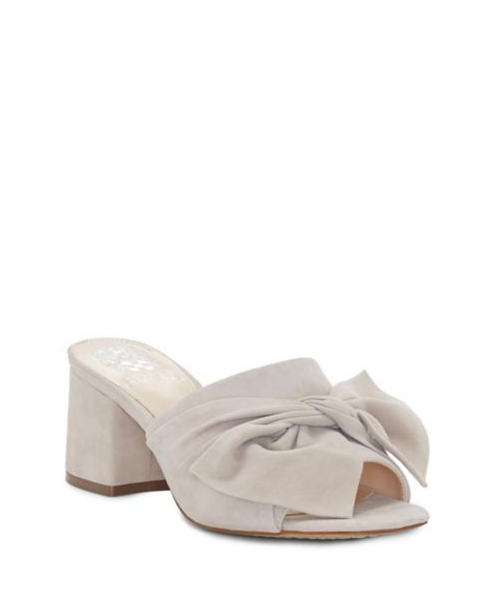 These are a blatant knockoff of the Balenicaga kitten-heel mules, but I have a feeling that most Forever 21 shoppers don't have $750 to blow on the real thing. That said, I love the shape of these, and that heel looks totally doable. 3. 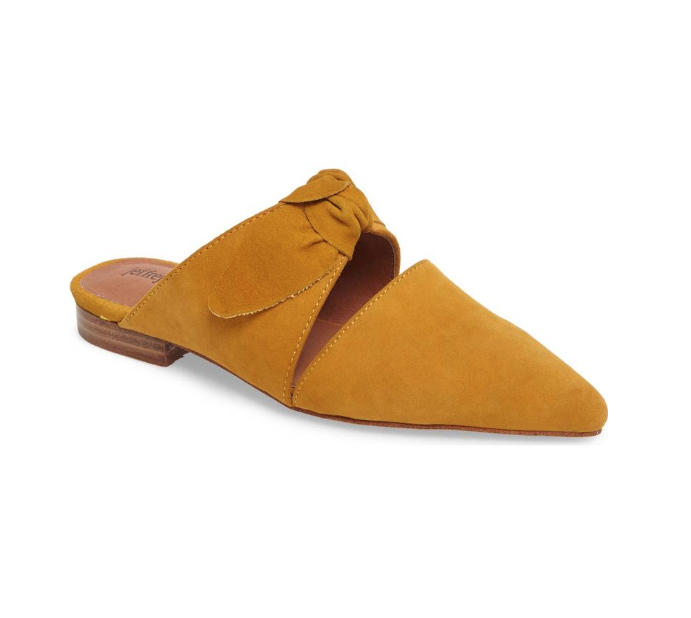 I could have included these in my mustard roundup but thought they'd be even better here. Also flat, I love the cutout detail. 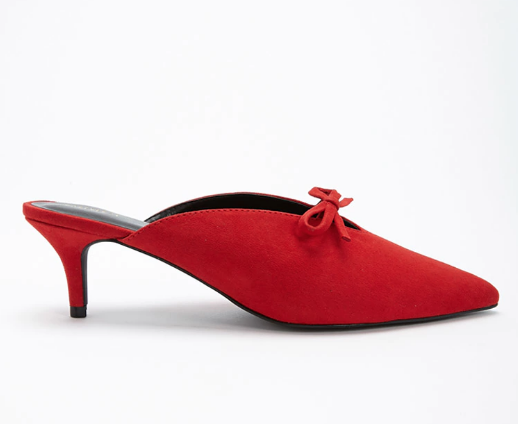 The bow is high enough on the instep that these should stay on comfortably as well. 4. 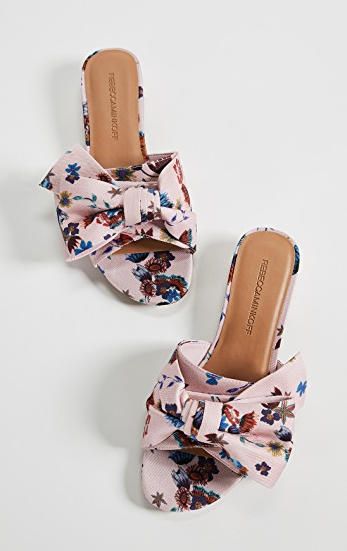 With a floral print and oversized bow, these mules are uber-girly, and yet I'm totally in love with them. The chunky heel looks nice and sturdy, and prevents them from going overboard with the cuteness. 5. Neutral color, sturdy but not too high heel, floppy bow, open toe...what's not to love about these suede mules? This is the type of shoe I could see myself wearing all summer. 6. 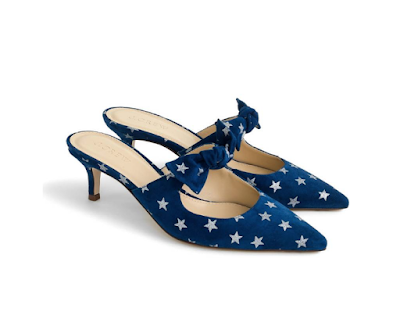 Just in time for Memorial Day, these have kind of a kitschy print, but it's balanced out by the sculpted kitten heel and sweet bow detail. I have a similar pair and they make your legs look miles long, too. I have never owned a pair of mules, can you believe that?! I love that mustard/yellow pair, the floral and white pair with the bow. So many cute styles! 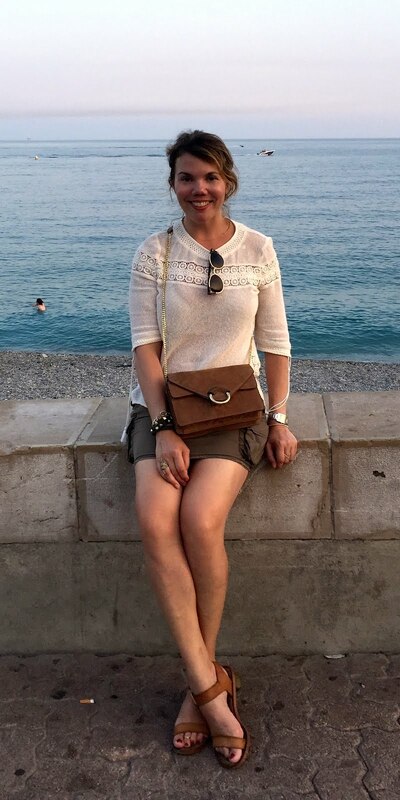 I have a pair of bow pumps, Your collection is fab! Those floral mules are darling! I haven't had a pair yet, I will have to keep a look out! I love a good pair of mules. They are so easy and comfy to wear since they slip on and off. What cute options. I love #4 and #6. I have a very similar pair to #4, but love these pink ones so much! Have a great week!